AUSTIN, TX - Dude, you're getting the Troon Golf experience! That's exactly what happens when you play the recently opened Teravista Golf Course in Round Rock. The slogan is even more fitting considering the course is located just minutes north of the computer company that has bombarded the television airwaves with a similar popular catch phrase during the past year. The Troon Golf experience is a unique one and begins as soon as you step outside your car and one of the courteous and professional staff members greet you, grab your clubs and place them on your cart. The introduction is quite similar to what you would find at a private country club, and that's just the way the folks of Troon Golf want it. "We are a public course but we strive to provide you with that country club feel for a day," said Danny Tatum, general manager at Teravista, which is managed by Troon Golf of Scottsdale, Arizona. To achieve that, the staff is focused on service. "We are old school," Tatum said. "We provide you with traditional service and our goal is to exceed the guest's expectations." 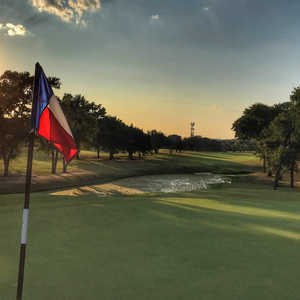 After you pay for your round, which are reasonable rates of $59 weekdays and $69 on weekends, you can head off to hit as many range balls as you want on what is one of the finest practice facilities in all of Austin - bar none. The 320-yard driving range, which has practice tees on both ends, features numerous targets. A 22,000 square foot practice green and a chipping green are also available to fine-tune your game before heading off to the first tee. In mimicking the old-style traditions found at courses in Scotland, Tatum said future plans for practice facilities include a putting surface on the back of the first tee box, which is a Tif Eagle surface. Before you tee off, you must check in with the starter. It is here where you receive a variety of things including instruction on the day's rules - cart path only or 90-degree - as well as a ball mark repair tool, bag tag and yardage guide. Again, sticking with tradition, Teravista passed on the GPS yardage systems to provide yardage guides that are, for all intents and purposes, more helpful than their technological counterparts, and a souvenir of your round. What's more, if you are so impressed by the course and its staff and decide to return the next day, you get a whole new set of accessories. While the staff and its service are impressive, the 18 holes of golf are nothing short of spectacular. Set atop a ridge just east of IH-35, Teravista overlooks the scenic Texas Hill Country and offers a variety of panoramic views of the surrounding countryside. While the Hill Country and its views are pervasive throughout your round, numerous gently rolling hills and wide-open spaces provide you with a distinct feeling of playing a links-style course. This combination of rolling terrain, various elevation changes, along with a steady breeze makes for a very challenging round. If that isn't enough, 70 white sand bunkers dot the 7,039-yard, par-72 layout. Water is featured on 14 of the holes. Although the combination water, wind, sand and hills are imposing to the average golfer, the beginner might be even more discouraged from giving Teravista a try. Not to fear. 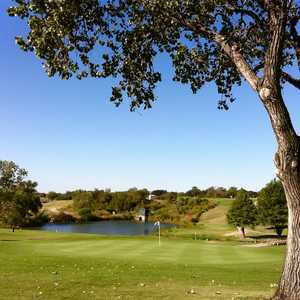 Teravista, which officially opened on August 28, offers the only set of "beginner-friendly" tee boxes in all of Austin. Tatum said Golf Digestrecently acknowledged the designation of the new type of tee box, which at Teravista can mean a reduction of 100 yards or more on some holes. This, he said, is ideal for those who are new to the game. "If it's a junior, a wife, or someone just starting out, they can play the beginner tee boxes." 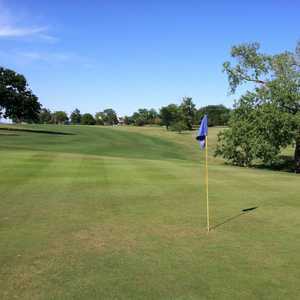 Another element incorporated into the course that is also "traditional" in its style and is helpful to golfers of all levels is the barber pole (black and white striped) markers, which are essentially targets in the fairway to aim at off the tee. They are also located in the middle of the fairway 150 yards out from the green. In addition, Tatum said there are 1,600 sprinkler heads on the course with 550 serving as yardage markers. He said, on average, a course includes 300 yardage markers. It's this attention to detail in both the barber pole markers and the sprinkler heads that makes Teravista and the Troon Golf experience one to remember. But the last and most impressive course feature at Teravista has to be the greens, which are among the finest in Central Texas. The Tiff Eagle greens are well groomed and provide a true roll on all your putts. Tatum said the well-manicured surface is all a part of the Troon Golf experience, which for him personally, consists of a 100-point checklist that he must go through each and every day to ensure the course is ready. Among those "points" and one of the main reasons the putts are so pure at Teravista is the grounds crew cannot mow the grass before sunrise, as is common practice on most other courses. Although this may push back tee times, it's the quality, not quantity, that Tatum is most concerned about. "We cut the greens in the light so we can see exactly what we're doing. We don't leave behind grass clippings that will affect the roll of the ball. It also enhances the aesthetics." When you walk off the 18th green and ride up to the clubhouse, which features a full restaurant, the Teravista staff waits, wanting to make one final impression. There the staff member will either follow or ride with you in your cart back to your vehicle, where they were towel down each one of your clubs. Finally, after each club has been cleaned and your bag is stowed away in your car, the staff member bids you farewell and you head off back to the daily grind that is life. While you drive down the little winding road toward the community's main entrance and pass several holes on either side, you can't help but reflect back on the four hours you just enjoyed. From the first greeting through the spectacular course and to the final farewell just moments before, it actually felt like you were at a country club. You just had a Troon Golf experience. From Austin, travel north on IH-35 to Exit 256 and Chandler Rd. Take a right on Chandler Rd. and go approximately one mile and the main entrance to Teravista is on your left. Go ½ mile and the clubhouse is on your right.